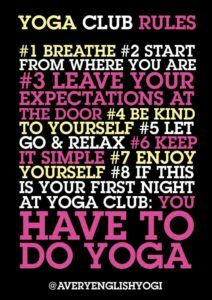 The 5th Yoga Club rule is one that seems quite easy, but for many is a conundrum. The rule is to “Let go, and relax”. Why is it a conundrum, when it seems so easy? It is likely that for many, the idea of “letting go” and “relaxing” isn’t as straight forward as it seems. For starters we find that we allow ourselves to tense or tighten up in response to whatever the day throws at us. Sometimes we aren’t even aware that we have tensed or tightened. It’s as if our subconscious has kicked in and done the tightening and tensing on our behalf. It’s only later when we have a knot in our shoulder, or back ache, or a headache that we realise that we were so tense, and so tight. Being tense, or tight, day in day out, over a long period of time, creates a new normal for us. So we end up being in a perpetual state of tension and tightness. So asking people to “let go” and “relax” is quite a challenge. Being perpetually tense and tight is probably not a helpful physical state to be in, let alone a great mental space to inhabit. So the call for relaxation and letting go is an opportunity to explore a return to a body and mind that is freer, easier, and certainly happier. But how can we do this? The first thing to do is to find somewhere to settle into your body and your mind. Most people find that laying in a pose called savasana – like a corpse – is a good starting point. But sometimes you can’t go laying around like a corpse. So an alternative is simply to find a position that you can feel comfortable in. If you are laying like a corpse the next bit is quite straightforward. Simply allow the ground to support you and imagine your body easing or some might say melting onto the floor. For some this is quite difficult. So a good trick is to lay there doing the opposite. Go around the body and tense and tighten each body part for a few seconds and then stop tensing that body part. Circulate around the body doing this. Then return to the idea of your body easing or melting into the floor which will support you. Another useful trick is simply to breath more fully, and more deeply. This fuller, deeper and slower breath can help you relax. Observing this breathing helps the mind relax too. Simply visualising the breath acting like water pouring into a vase on the inhale, and being poured out of the vase on the exhale can also help. The final trick to “letting go and relaxing” is using some form of visual or aural focus. Staring at a beautiful picture or a candle flame or repeating a word that you like over and over can be helpful. Yogis like the word Om. But equally you can find a poem or saying that is helpful and repeat this over and over. Of course, there are many other tricks you can explore to “let go and relax”. Actually doing some physical yoga postures (asanas) or breathing (pranayama) can be helpful. Some people find going for a brisk walk or working out with weights, or swimming or cycling can help. The ultimate trick is to get to a place where you can relax and let go during your daily life. Not letting things tense or tighten you. How do you do this? That’s for another time but maintaining a sense of self awareness and observing yourself in your daily reactions and interactions is a helpful starting point. Keeping an eye on your posture and noting when your body armour locks into place early is a good red flag that you are tensing and tightening. Ensuring that you are breathing fully and slowly helps to manage this too. Considering how you view the world and things, including people can be helpful too. Is the world a mirror of ourselves, or are we mirroring the world? Observation of ourself and the world can be illuminating and helpful in our exploration of “letting go” and relaxing in our daily lives. We have nothing to lose except our tension. Newer Post Gomukhasana : cow face pose or light headed pose? Older Post Can standing on one leg really sort out your bad mood?